"Purchased from the Seagrave Fire Apparatus Co. of Ohio at a cost of $9,500, this sedan-style pumping engine was first shipped by railroad to New Orleans to the International Fire Chief's convention. After the convention, where it received considerable attention from Fire Chiefs from around the world, the engine arrived in Cambridge on October 7th. Before it was put into service on October 27, 1938, a four-hour Underwriters pump test was conducted at the Wakefield Water Department pumping station at Crystal Lake. This 750 GPM pumping engine had a 100 gallon water tank." -- Text from calendar by Jayne M. D'Onofrio. 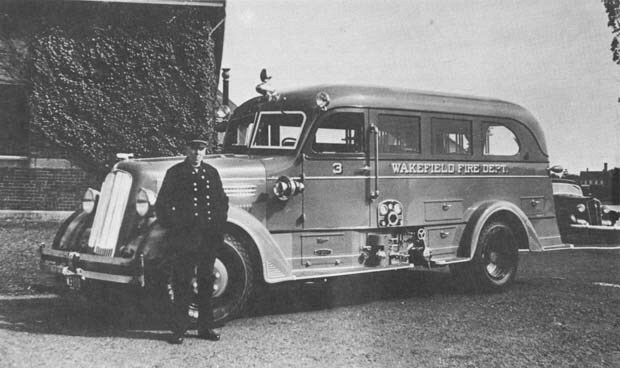 “Wakefield Engine 3, 1938 Seagrave fire apparatus, Chief Frederick D. Graham, October 13, 1938,” NOBLE Digital Heritage, accessed April 22, 2019, https://digitalheritage.noblenet.org/noble/items/show/7124.